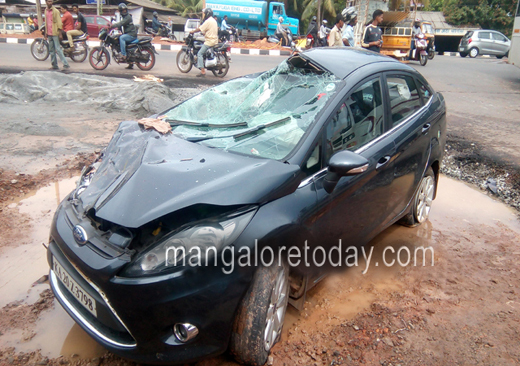 Udupi June 6 ,2016: In a tragic incident when a bus collided with a tempo and fell upon a passing car here at Udupi on Monday June 6th. 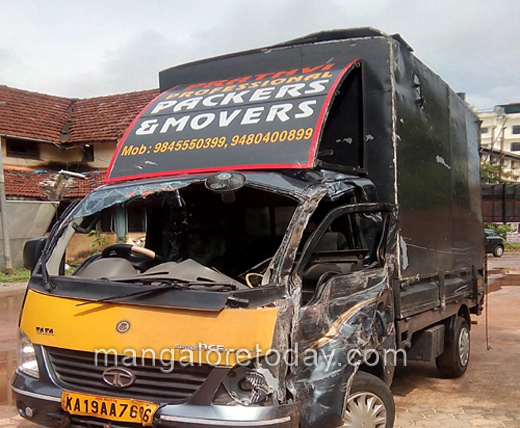 The speeding Ace Tempo collided with a express bus which was on the way to Udupi from Mangaluru, Soon after the collision Tempo rolled over a passing car belonging to Udupi District Hospital’s Dr Sudesh who was on the way to Mangaluru from Udupi. Dr Sudesh’s son Vaibhav sustained minor injuries and is under treatment in Private Hospital. Tempo Driver miraculously escaped but co-travaller Rajith, Dinesh, Ashok and Athik sustained minor injuries. Case has been registered at Traffic Police Station.